This is an unbelievable price for the best location. It is within walking distance of everything downtown in a family friendly neighborhood. You can walk to all Riverfront attractions and restaurants. It is a luxuriously designed historic home that incorporates convenience and comfort with warmth and character. It is a legal nightly rental. This Victorian home is one of many that the owner has restored in downtown Chattanooga. Other homes by the owner were featured on HGTV and in 'Southern Living Magazine'. Any visitor will enjoy the quality and style that this house provides. The owner has multiple vacation rental properties either next door or within a 2 block walk. This allows for larger groups to be near each other. 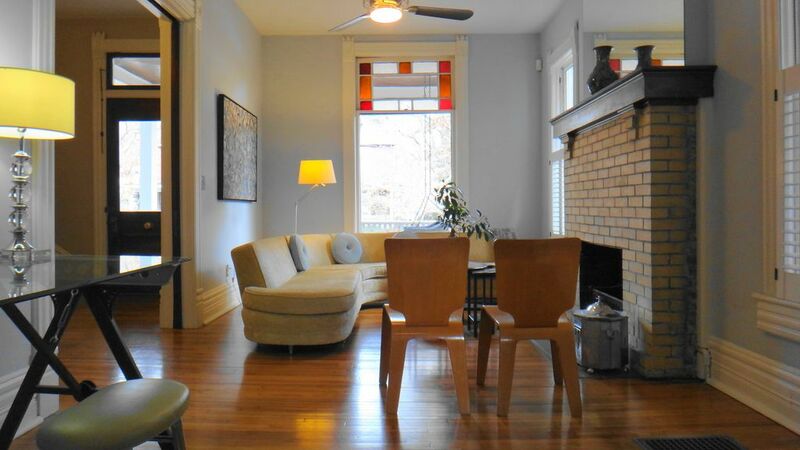 This beautiful Victorian home is located in the oldest neighborhood in downtown Chattanooga. The historic tree-lined walking neighborhood is a few minutes walk to all of downtown Chattanooga and its sites. The neighborhood is beside UTC and Erlanger Hospital. The impeccable restoration of this home, retaining all of the 1897 character, but incorporating a modern style allows a relaxing and comfortable experience. The home flows easily with its open floor plan and spacious living spaces. The eat-in kitchen boasts state of the art stainless appliances and marble counters. Three of the four bedrooms have queen beds, with one additional bedroom that has twins. There are also two twin daybeds in the 750 sq.ft. 3rd floor suite. There are luxurious linens that allow for comfortable sleep away from home. The bedrooms effortlessly accommodate ten people. The master bedroom suite has its own private balcony, fireplaces, walk-in shower, claw foot tub and double sinks. It is a haven in itself. The den hosts a flat screen HDTV, fireplace, and comfortable leather sofas. There is a great front porch with benches and a swing to relax outside. The home's location allows minutes access for business travelers or visitors to any of the local businesses, preparatory schools, hospitals, or UTC. For the cost of any local downtown hotel you have the comfort and privacy of a 3250 sq. ft. in this home. You can enjoy all of the downtown and riverfront sites and activities. You may enter with the ease of a lock box and never wait in a line. It is a perfect place to rest and relax while enjoying all of Chattanooga's amazing attractions. Leave your car parked in the off street parking behind the home and walk to the Aquarium, the Bluff View Arts District, Coolidge Park, the Walnut Street bridge, or many of the other downtown restaurants and shops. Either way, driving is only minutes. Like many of the homes off this time period there are steps going to the first floor as well as to the second floor to two of the bedrooms. Therefore, it is not well suited for handicapped or elderly guests. Call with your credit card information to enjoy this wonderful home. I grew up in Atlanta and after years of living many other places and out of country, I chose Chattanooga to become my home and to restore homes. I am also an artist and my home is filled with my art as well as from other artists. This is a quaint but vital neighborhood that has diversity and a real sense of community. I can walk and run anywhere in the vibrant downtown Chattanooga. The convenience and stature of this neighborhood makes it stand alone in Chattanooga. I love that my house feels like a Victorian townhouse that embraces the beautiful architecture of 1897 with the abstract and modern design that when interpreted well is timeless. There are various herbs, seasonings. Stainless appliances, open floor plan with 3 living areas including sun porch. Walk in shower and claw foot tub in master bath. This is an incredibly beautiful Victorian home! We enjoyed our stay, and had everything we needed. There were plenty of bedrooms and bathrooms for our group of nine. It was relatively close to the downtown restaurants, etc, and it was in a relatively quiet area. (Some of our group complained of old house noises during the night.) We loved the upstairs porch. Personally, I loved all the historic design details in the house (pocket doors, crown molding, clawfoot tub, etc.) Beautiful property! Great size for a group! Clean, convenient, and comfortable. Great location to access downtown and sights such as battlefields, Lookout Mountain, zoo, aquarium, and riverfront. Highly recommended. Owner was very helpful and accommodating with parking for 4 cars. My trip to Chattanooga was to visit my son who is a student at UTC. The house was a block from his dorm. We were comfortable and I had a nice kitchen to make some of his favorite meals, which resulted in plenty of leftovers for him to take back to his dorm. Also, thank you to the owner for the delicious brownies! The house was for our adult children with their teenage kids (total 10 people) from December 26-31. They all enjoyed staying there. We made the right choice choosing this place. We received good and prompt cooperation from the owner. We had 2 secure parking spots at the house. We needed 2 more parking spots. The owner was able to provide 2 more parking spots for the first 2 days at the house. We appreciate that. God bless Jo Beth in your business! Repeat visitors had another great stay. Our extended family of 7 stayed in this same house for a holiday weekend two years ago. We enjoyed it so much that we returned again this year. The location and accommodations are excellent. The house is as pictured and described, and Jo Beth makes everything easy. Would recommend highly. Wonderful place to stay. Quiet tree lined street. This lovely Victorian had everything we needed. A great place for a large group. Within 1 block is a Chattanooga Bike Kiosk that has either free or very inexpensive bike rentals available and can be used all over downtown Chattanooga! $100 cleaning fee. 8% occupancy tax. Iron man 5 night min. Will do 2 nights when fewer available or adjacent to another booking. NO EVENTS, PARTIES OR GATHERINGS! OCCUPANCY ENFORCED. 4 night minimum Thanksgiving and Christmas. 100% refund outside of 30 days of reservation less $25 fee. Rates subject to change.